The last two days have been magnificent here on the Florida panhandle. It has been in the upper 60’s and lower 70’s during the day, but still quite cool during the evening. We have enjoyed long walks through the dunes and beach, as well as sitting outside and enjoying the nice weather. Woolly and me on the edge of the beach this morning. Woolly Bear’s paw has healed, and he has made two visits to the local Bark Park so that he can run around safely. This morning we walked to the beach and spotted 6 Brown Pelicans, a Great Blue Heron, several towhees, cardinals and mockingbirds. This has been a lovely campground and we are sorry to break camp tomorrow to travel west. For those of you interested in campground details, the sites in the older loop (where we camped) have lots of vegetation between sites to provide privacy. Each site has 30 amp electricity and water, and the restrooms are modern and clean. There was a mix of small RVs, trailers, tents, and truck campers in our loop. The newer loop, with full hookups, provided less privacy but had much more room for the large RVs that camped there. All sites had really good phone reception ( AT&T 4G) and our TV antenna brought in ABC, CBS, NBC, and Public TV clearly. As the weather warmed, the beach became a bit more populated. Still lots of room , though. The site cost $168.00 for 7 nights, or $24.00 per night. Not bad for a waterfront site! We will definitely plan to visit Grayton Beach again! 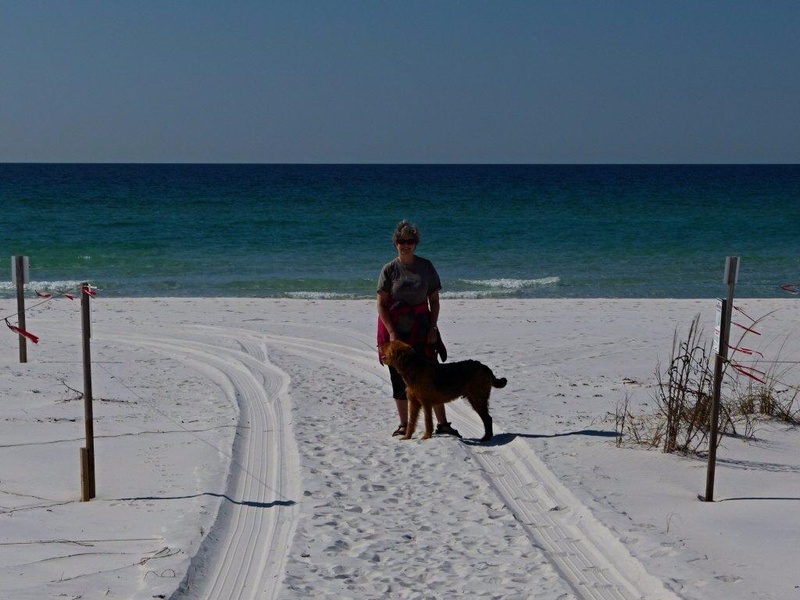 This entry was posted in camping, Florida, Grayton Beach, Rving on March 1, 2014 by Ramblin' Rose. Looks like you have found a piece of paradise! …and ALL those birds too! 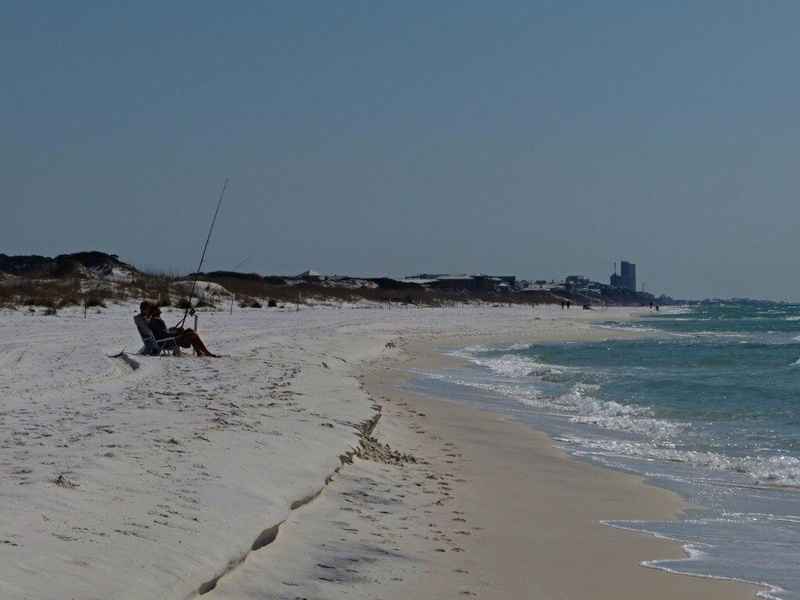 How lucky you are to be basking in the sun and white sand…as we wait for ANOTHER snow storm! The beach is absolutely beautiful! So glad to hear Woolly Bear is on the mend! Looking forward to your next adventure posting! Hi Liz, thanks for reading! We know we were fortunate to escape Ct when we did. Between the subsequent ice and snow, I don’t know when else we could have navigated our hill! Enjoyed reading about life on the panhandle and looking forward to reading the next post. Love the birding reports! Thanks, Dot. The South is a birder’s paradise right now. Diane, we are in Louisiana now, heading for Texas via the scenic route!